The new $700 million high-tech stage is opening at the Mariinsky Theater in Russia’s northern ‘cultural’ capital, St. Petersburg. The Mariinsky Ballet and Opera have proved immensely popular all over the world for the past two centuries. The festivities on Thursday include a gala opening conducted by Valery Gergiev, the worldwide celebrated artistic director of the theater, and features renowned performers – musicians, opera singers and ballet dancers. Placido Domingo, Yuri Bashmet, Ulyana Lopatkina, Denis Matsuev, Anna Netrebko, Vladimir Shklyarov, and Diana Vishneva are among those who will star at the show. The concert is directed by young Russian talent Vasily Barkhatov. The Mariinsky II building's architect Jack Diamond, of the Canadian architectural firm Diamond and Schmitt Architects, considers the building the “crown jewel” of his career and claims that he was inspired by the composers Glinka and Rimsky-Korsakov. “The second stage is, on the one hand, the continuation of the traditional buildings of the city, on the other it is a modern building with its uniqueness. This is a city within a city. It is the crown jewel of my career. I am very encouraged by the results. The inspiration for the creation of this project was the stage of the old theater. Glinka and Rimsky-Korsakov were sitting on my shoulders,” he is quoted by the local media. Diamond and Schmitt received the project after the previous architect Frenchman Dominique Perrault had a dispute with the management of the theater and the city authorities. He offered to build a"golden veil" - a huge transparent dome shaped complex for the realization of which allegedly several surrounding historic buildings had to be demolished. Alongside the historic building of the 1860 Mariinsky Theater, and the 2006 Concert Hall, the new contemporary building of Mariinsky II forms part of a unique theater complex. The Mariinsky II, covering 79,114 square meters, is one of the largest theater and concert venues in the world. The eight years of construction cost the federal budget $700 million. The vast auditorium will seat up to 2,000 people at full capacity. 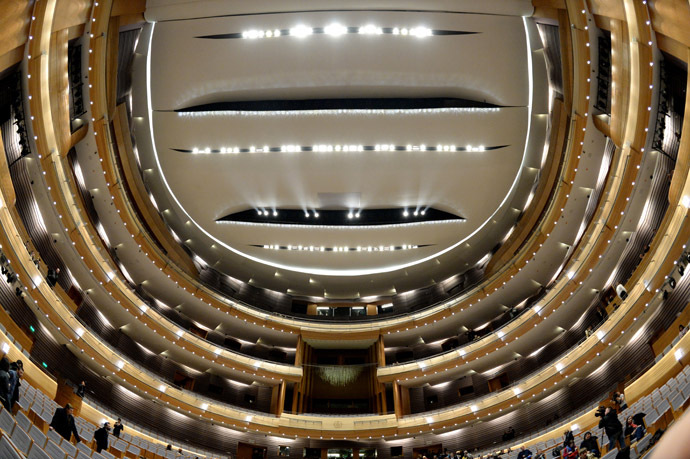 While the auditorium of Mariinsky II is a contemporary hall, its principles are those of famous 18th- and 19th-century opera houses, with a horseshoe shape and three balcony levels. The Mariinsky II, equipped with the latest high-tech technology, features ‘perfect acoustics’. “As for the equipment – it’s some of the best. I think we took a step forward for 100 years," said renowned Russian artist Vasily Gerello as quoted by Channel 1. “In contrast with historical theaters with several balconies, the Mariinsky doesn’t have plush,” said Jürgen Reinhold, an engineer from Munich-based Müller-BBM, which participated in the construction. “Ideal volume was created, so that the sound can be freely dispersed in the auditorium" he is quoted by local media. The use of three balconies instead of four allows for more height between levels and creates better sound dispersion. The sculptured beech balcony fronts are also shaped by acoustic demands. "Of course, Mariinsky II is the best stage, apart from the Bolshoi Theater, however, I also cannot say that the Bolshoi Theater is better or worse,” chief lighting designer at the Moscow Bolshoi, Damir Ismagilov, told Channel 1. When developing the concept of the stage space, the most exemplary contemporary analogies were used, as have been the best practices of recently built or recently renovated theaters throughout the world – the London’s Royal Opera House, Copenhagen’s Royal Opera, Paris’ Théâtre du Châtelet and many others. No expense was spared on the materials used for the luxurious exterior and interior of the new Mariinsky II. The exterior of the building is made of beige Jura limestone, interspersed with floor-to-ceiling windows of various sizes topped by a metal roof. The main foyer features rear-lit onyx stone walls and Emperor marble floors. The surrounding glass façade lets natural light illuminate the foyer space during the day as custom-designed Swarovski chandeliers take over in the evening. The main foyer provides unique views of the Mariinsky Theater across the canal. The architectural appearance of the new contemporary building has caused hype among urban activists. The locals started coming up with nicknames such as ‘Mariinsky shopping mall’ or the ‘St. Petersburg Quasimodo.’ Several designers offered to mask the façade with a big blind, as was once done with the Berlin Reichstag. Bloggers have collected thousands of signatures for its demolition and the reconstruction of the previous historical sites such as house 5a on the Kryukov Canal, the only surviving part of the Lithuanian market, built in 1787-89 under the project of the Italian architect Giacomo Quarenghi. In 1920, the Lithuanian market burned down, and only the central façade was retained and later was recognized as an object of cultural heritage. The reconstruction of the old stage is scheduled to begin no earlier than in three years’ time. The main building of the Mariinsky Theater, despite several previous reconstructions, cannot accommodate large-scale scenery for performances. During the time of reconstruction the theater troupe will distribute performances between the new stage and the Mariinsky Concert Hall.